I took a little jaunt to the market the other day (such a strange word, jaunt?). Anyway, there’s a market up in Poulsbo not too far from where I live that I love shopping at. It’s mostly food but they have a fun little flower area. I love looking at their spring blooms. They had such beautiful colors and varieties of flowers and greenery I couldn’t help myself. I kept picking up new stems, trying different combinations and texting photos to my daughter Courtney showing her how delighted I was with all the colors and shapes. She’s used to my exuberant texts when I find pretty things and is always so gracious to stop what she is doing and have fun discussing important matters like flower combinations with me. Soon I found just the right ones! Note to self: PLANT MORE SPRING FLOWERS IN THE YARD for cut flowers. Must. When I got back I removed the winter stems out of my door basket, filled up three jars of water in the basket and put the springy blooms in. Instant JOY, it just looked so pretty! I was so inspired by the door that I cleaned up the porch and got rid of some random things that were on it (including a moment of shame, a tiny shriveled moldy pumpkin hiding behind a few planters, awesome — that’s happened two years in a row now!). It only took a few moments to spruce up the porch and door, but I was so glad I took the time. Sometimes I feel like we are so quick take care of everyone and everything else that we don’t always take the time to treat our home or ourselves to the TLC we deserve. So, if you haven’t already, let’s say goodbye to winter! Go treat yourself to some pretty flowers this week. If it’s still snowing there (I’m sorry!) you definitely need some spring blooms on your table. Find similar hanging door baskets by scrolling the arrows above, or the closest one to mine here! Oh, every Spring, I, too, make notes to myself about planting more bulbs in the fall. As hard as it is to believe, however, every fall I find myself a tad burned out + tired . . . meaning I don’t always get those bulbs planted! Oh, well. Here’s to best laid out plans! Pretty! I plan on going to Trader Joe’s this week for some blooms for the Easter table. I like the idea of using a jar inside of a basket. That gives me a great idea for my centerpiece! Beautiful! We are getting ready to move in to a home with a door like this so I will definitely be buying a basket for the front door :). Question for you, can you post a photo of the space above the stairs (its kind of in the background of your front door photo)? Curious how you decorated that space. I loooove that door basket!! Great idea as I always prefer fresh over fake when I have the choice. That could work inside too, no? Thanks for the inspiration. So pretty Melissa. I have the same door basket. I think I will put some fresh flowers in it for Easter weekend. Sweet willow baskets like yours always make my heart sing. I’m always keeping my eyes peeled for those that would be perfect to hang on my house filled with soil and summer flowering plants. The willow baskets handle the elements fairly well and have just the perfect natural look. Were you at Central Market? I love the flowers and the basket on the door. I have a similar basket and never thought to put fresh flowers in it. duh. I love the Gerbera daisies, so very pretty. Yes, it’s Spring! Nothing like fresh flowers to brighten things up. I buy a big bunch and full up multiple Mason jars and put them all over the house in every room. I collect mason jars and little vintage vases from garage sales. I Love them for flowers. These look amazing! I’d love a door basket but have no idea where I could find one in the UK! Oh, I miss that market in Poulsbo…..Your flowers are beautiful…. That arrangement looks so springy and cheerful. It’s still below freezing at night around here… it actually snowed this morning, which has got me DEPRESSED! But I did guy some flowers at Costco today because I just have to bring some fresh life into this space. I’m laughing about the baby pumpkin – I think our squirrels would have devoured it long ago… made me smile! Oh my gosh, those are beautiful flowers. You did a great job arranging them–I would want to just look at them all day! Hi Melissa! 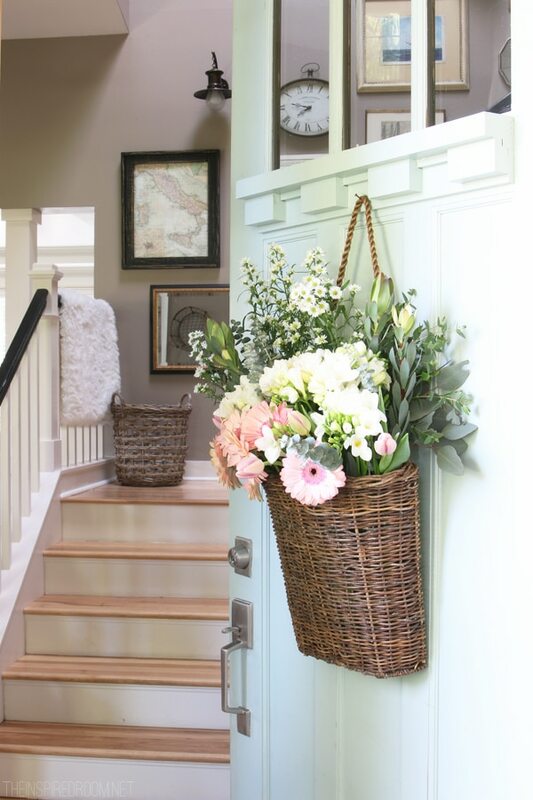 I love the idea of fresh flowers hanging on the front door. So pretty & Inviting! Your display of flowers are so beautiful, I just makes me want to smile :) Love your front door too! I have seen this, I have shared this and now I am doing this! It is gorgeous and I’m heading to the market tomorrow so I can do it on my front door. What a stunning display! I have this same front door and just love what you’ve done! What’s the brand/name of the paint? I really want to create this look it’s amazing! where can i buy the door baskets from please. 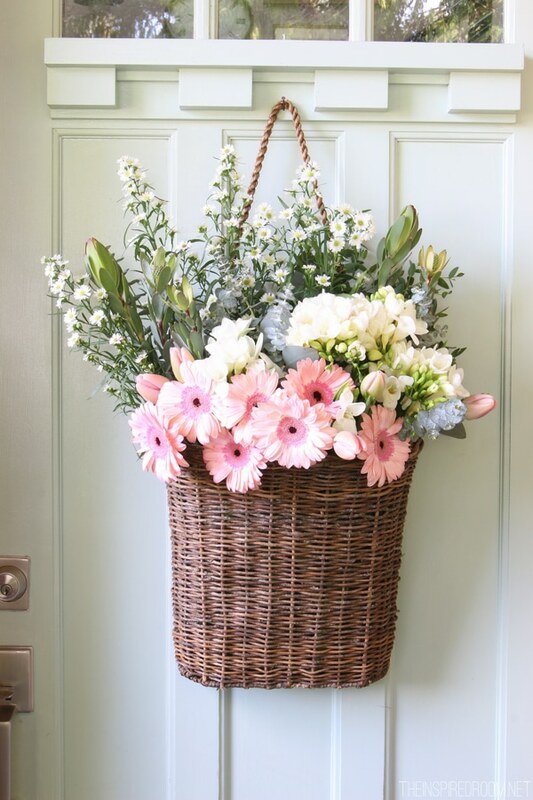 Lovely door basket, even with fake flowers that would be a nice addition.